Location: Cranborne, Dorset, England. (SU02450994). Grid Reference: 50° 53' 30" N, 1° 57' 57" W.
Although the henge at Knowlton appears to be a fairly small construction, it is in fact one of the last surviving parts of a much larger prehistoric complex. One of the most important complexes in Wessex. The remaining henge was Christianised in the 12th century with the construction of the Norman Church in the centre of the central henge. The group of Late Neolithic henge monuments at Knowlton is generally recognised as one of the five most important enclosure complexes in Wessex at this time (Renfrew 1973; Wainwright 1989). The Heritage plaque at the site says that the henge was constructed c. 2,500 B.C, consisting of a ring bank with two entrances and an internal ditch, 'probably intended for ceremonial use'. 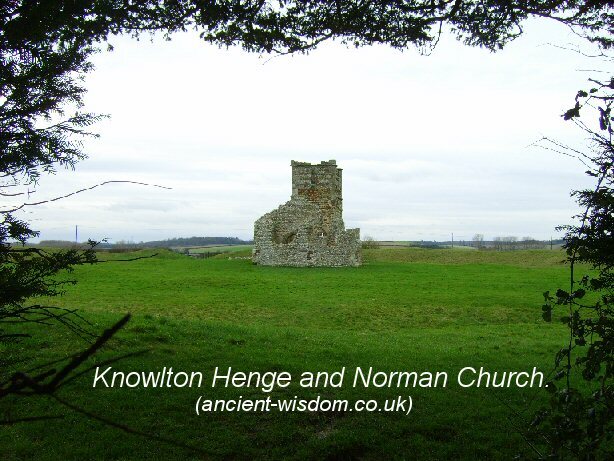 It is now realised that the Knowlton henge was only a single part of a larger 'sacred' prehistoric landscape, which was re-used for thousands of years, ending with the construction of the Norman church in the middle of the central henge in the 12th century AD. 'Knowlton Rings' consists of 4 earthworks: the North Circle, Church Circle, Southern Circle, and the 'Old Churchyard'. 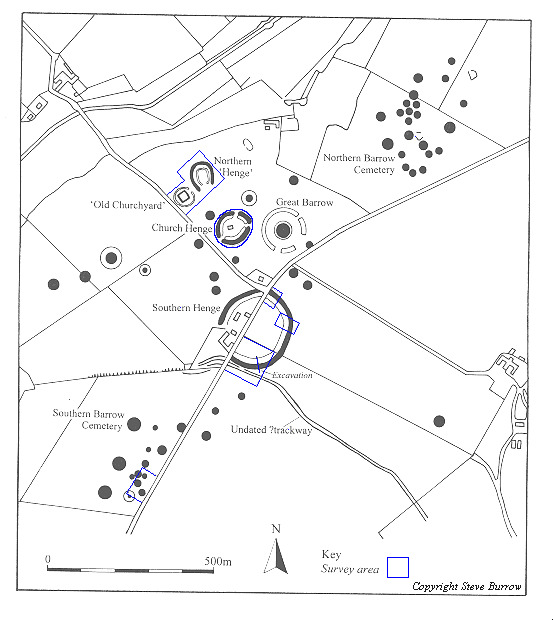 In addition to these sites, to the east of the Church Circle is the Great Barrow, the largest round barrow in Dorset, and almost certainly directly related to the henges. 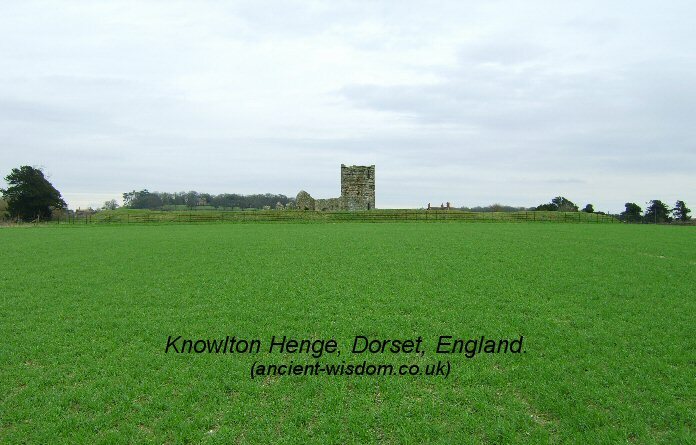 (1) The most prominent site in the complex is the 'Church Circle', now commonly called Knowlton Henge. (Not far to the west of Knowlton is the Dorset Cursus, running for over 6 miles in length). Article: Bournemouth Daily Echo, 10th June 2005. 'An ancient standing stone from a lost stone circle has been unearthed by dowsers in east Dorset. 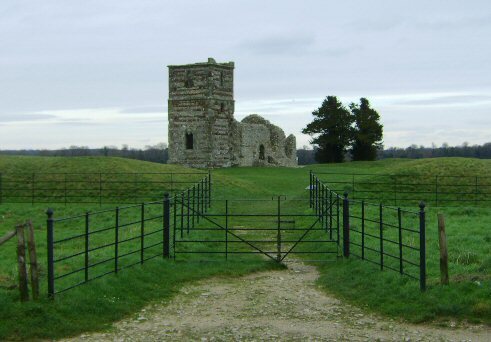 Students on a local dowsing course discovered the hidden Bronze Age relic at Knowlton Henge, two miles south of Cranborne. Experts are calling it one of the most exciting finds in the region for years. And, intriguingly, the dowsers pinpointed the ancient flat stone after spotting an energy line on a photo of the area. "It's a very significant find," said Paul Craddock, chairman of Wessex Dowsers and a local dowsing tutor. "Where the stone was discovered, we believe there may have an avenue of stones. 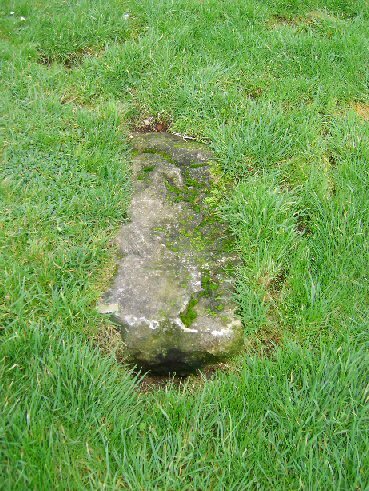 We also think there is a second stone close by, buried upright in the ground". The large slab is thought to have been part of a stone circle which was widely believed to have been either knocked down or broken up when the 12th century Norman Knowlton Church was built on the same spot'. It is suggested that other stones may have been used in the church's foundations, and to form part of the altar. 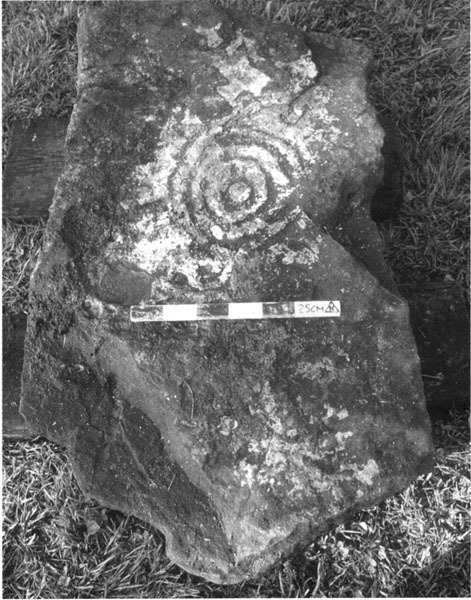 Article: Concentric stone found in Knowlton southern Henge. During the Spring 2000 season of the Wyke Down project (see French et al.) an exciting archaeological discovery was made. Two large stones were ploughed out of the southern henge at Knowlton, Dorset c. 30 years ago were located on a farm (Knowle Hill Farm, part of the Shaftesbury Estate). It was suggested that the stones came from the bank of the south-eastern section of the henge (Fig. 1), and that one stone had artwork on it. The two stones were found and examined. They appear to be heathstone, an iron-rich sarsen stone, which is found locally at the edge of tertiary deposits, but this is yet to be confirmed. The Henge and Church from outside. Looking across from the Southern entrance to the Northern entrance. A large prostrate stone in the ground within the Knowlton henge.